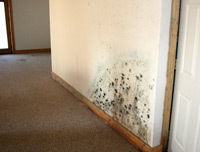 Mold is an environmental problem in rental apartments across the nation. As a renter or a tenant, you have a right to have a mold problem remediated in a timely manner. Because exposure to spores can lead to chronic and severe health problems, living in a mold-infested apartment presents many problems, legal and otherwise. – Clean any moisture or wet spots anywhere in your apartment as they occur. If water or moisture reoccurs, check for the source. You may have a plumbing or roof leak. – Keep the humidity level down with a dehumidifier. – Make sure your clothes dryer vents properly to the outside of your building. – Make sure your bathroom has proper ventilation. Problems that are related to the apartment building itself (such as plumbing, roof leaks or structural damage) may require more extensive work and would be your landlord’s responsibility. If mold is found in your apartment, you should first report the problem to your landlord. Keep careful documentation of all correspondence. You may find a small amount of mold and decide to clean it up yourself. There are potentially serious risks in removing the mold yourself. For example, peeling back wallpaper or taking up tile can release mold spores into the air. Without following the proper safety guidelines, spores can spread throughout the apartment. If the mold contamination is due to your landlord’s negligence, perhaps due to not making proper repairs or upkeep, then you may have a legal claim. Some tenants have won legal cases against their landlords for neglecting mold problems. Keep receipts of all expenses related your own cleanup costs, and document any medical bills that may be related to the issue. In New York, you have the right by law to withhold your rent or to seek an abatement (a reduction in the amount of rent owed.) However, there may be serious consequences for paying your rent. You should seek the advice of an experienced tenant attorney or tenant advocate before taking that type of action. H&H Environmental performs mold testing and remediation services for homes and businesses in Connecticut, Massachusetts, New Jersey, New York, New York City and Pennsylvania.